Family: I farm with my husband Jeff and two grown children, Mike and Jenny. Tell us about your farm. We both grew up on dairy farms in the area. Jeff farmed with his parents until they retired. They milked around 40 cows and carried the milk to the bulk tank. We purchased the neighbor’s farm, put a pipeline in and started a new venture on our own. Mike was 4 years old and Jenny was 6 months old. We purchased cattle to fill the barn, which had 51 stalls in it and built up cow numbers to eventually build a freestall barn. We kept milking in the old barn. The final step was putting up a double-14 parallel milking parlor and adding on to the freestall barn. We also cash crop besides milking cows. Our herd has an energy corrected milk of 98.5 pounds per cow and has averaged under 100,000 for somatic cell count for two years. What is the busiest time of day for you? Mornings are the busiest time of the day because I am a morning person. There are scheduled tasks every day of the week. When you get a spare moment, what do you do? I like to garden in the summer and do canning in the fall. Tell us about your most memorable experience working on the farm. I have two that come to mind. Our two children both staying on the farm with us, and being able to work together as a family and building the dairy facility from the ground up. 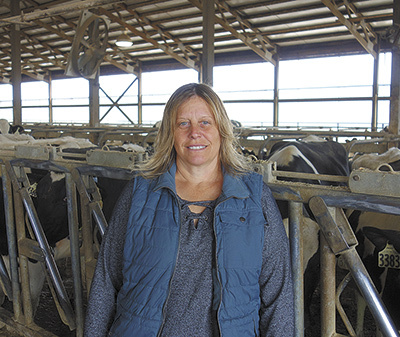 What have you enjoyed most about dairy farming or your tie to the dairy industry? I truly enjoy the cows and farm life in general. I knew from young on this is what I wanted to do. I also enjoy the employees that are part of our team. Without them we would not keep the day-to-day work complete. They are my extended family. There are a lot of friendships built leaning over a gate or standing in manure, and I still keep in touch with employees who have passed through our doors and moved on. How do you stay connected with others in the industry? I’m not big on attending meetings so a lot of the connections are people I work with in the industry. Social media is also a way of connecting with people. Who is someone in the industry who has inspired you? My parents. I watched them struggle through tough years dairying and pull themselves through with hard work and determination. My dad passed away from cancer, and through the treatments and up until the week before his death, he managed to get himself in the tractor to mix feed because farming is what he truly loved. That was very inspirational to me. If you could give a tour of your farm to a prominent woman in today’s society, who would it be? Melania Trump. I want her to see for herself the day-to-day struggles and triumphs we endure to feed the world. I want her to understand what our farm means to us, and that we have the consumer’s best interest at heart. We need her to be an advocate for the dairy industry. What is the best vacation you have ever taken? We are fortunate to be able to vacation quite a bit because of the children and a good staff of employees. Hawaii’s Maui island is one of our favorite places to travel. But, every vacation is amazing because I get to spend quality time with Jeff away from the farm, and it’s a good time to look at the farm from a distance and maybe see something that is not seen when at the farm every day. What are some words you like to live by? The lyrics to the song, “Humble and Kind,” by Tim McGraw. “Don’t take for granted the love this life gives you. When you get where you’re going, don’t forget turn back around. Help the next one in line. Always stay humble and kind.” In my journey through farming, there were people who sent me in the right direction and sometimes in the wrong direction, but every situation taught me something. If someone has a question, I will answer it as best and honestly as I can. And, I will always remember the people along the way who taught me how to fight through whatever life deals me. I was put on this earth for a reason.